This morning Roy and myself set up our part of the exhibition 'LINE, FORM AND LIGHT' which starts tomorrow, Tuesday 11 April. 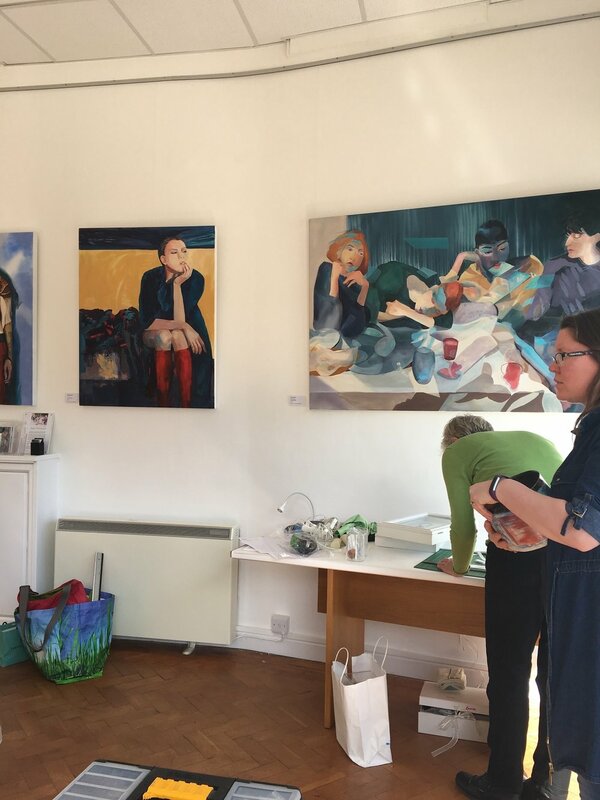 This lovely space is relatively new to Worthing and is a much needed space for artists to exhibit. Changing every two weeks set up day is on a Monday and we were helped by the experts Claire and Richard who run the gallery. It is a big light space and our exhibition will be colourful, diverse and really interesting. There are 6 artists in total, all from Sussex. A lot of the work is very tactile, with bright colours and intricate details in ceramics, photography, jewellery and glass and pewter. I am preparing paintings for the September Brighton Art Fair and am on course for having all new paintings to show on the stand. I am sharing the stand with close friend and ceramicist Frances Doherty (Website here) for the 2nd year running, we work well together and it means we can show our work on a good sized stand. We discovered using floor and wall space "pulls" the stand together and having a larger stand doesn't crowd visitors, it gets very busy, thus providing room to stand and look. This art fair is one of my main shows of the year. I will be showing a total of five unseen paintings all sized at 1m x 80cm in acrylic. It will be the 7th time I think that I have exhibited and it is always a very busy and lively art fair to be at, it is also local to me which I love as I get to meet up with other fellow artists and leave my studio for four days of art fair madness. I always paint for the exhibition as I am keen to show only new paintings. Although I am reluctant to leave my studio after so many hours at the easel, after talking for four days non stop I am soon pretty keen to get back in it. So now I am using acrylic paint full time after 20 years of being smug about using only oil paint. I Have to admit I was a bit sniffy about acrylics in the past but I soon started to re-evaluate acrylics as I was teaching them in my class, so learning a lot about them. And now I have fallen in love with my 'new acrylics'. The quality and technology of these paints has come on leaps and bounds even in the last 10 years and they really have opened up a different painting language. So currently I am experimenting with layering and transparency with the view to convey accentuate my idea of movement. The new paintings focus what has become my main preoccupation - dance and the figure in motion. The drawings are taken from video stills and you may notice mini "series" with paintings with a similar title. The reason for that is that I may complete lots of drawings from one dance piece and sometimes they develop further into paintings. One of these was "Vertigo 20", choreographed by Noa Wertheim, an extraordinary artwork and a fabulous video which you can watch below. I loved everything about this contemporary ballet, the colour, costumes, set and the feelings the dancers gave. It inspired lots of drawings, some of which have been painted and will be on show at the art fair. If you would like a private view ticket or a 2 for 1 weekend ticket see my events page or email me. Brighton Art Fair details are also there.